After spending a couple of days in Penang, I couldn’t help but think: what took us so long to come here? For most of our traveling years, Penang wasn’t even on our radar. And, now, I could easily think of even living there for a while! 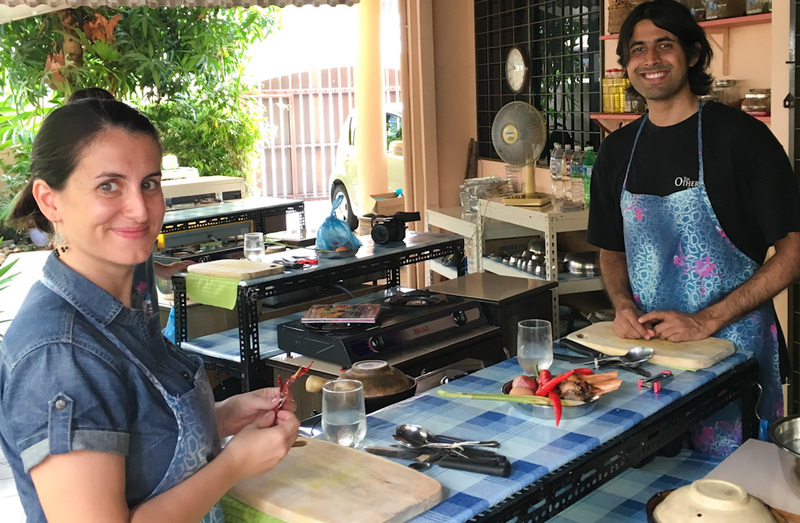 If Malaysia is known as a melting pot of ethnicities, cultures and traditions, the island of Penang takes this interesting mix to a whole new level. Thanks to its strategic location by the Strait of Malacca, Penang has historically been an important port for trade. Over the centuries, the island has seen people from all over the world passing by. At different points, the region has been inhabited by Malays, Arabs, Europeans, Indians and Chinese. Now a days, Penang is the only area in Malaysia where ethnic Chinese are the majority. This blend of cultures has got to be the biggest attraction in Penang, as it reflects on all aspects of life: religion, customs, ways of life and, of course, food! 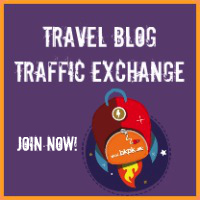 While you can feast on authentic Indian, Chinese, Malay and several other cuisines in this food obsessed region, you will also encounter a lot of fusion preparations. Penang is also the only place on earth where you will be able to enjoy Nyonya food. Nyonya is the fusion between Chinese and Malay culinary styles. Nyonya cuisine follows a lot of the same principles as traditional Chinese food, but in this case makes use of the local Malay ingredients. The result doesn’t taste neither Chinese nor Malay. It simply tastes like Nyonya! 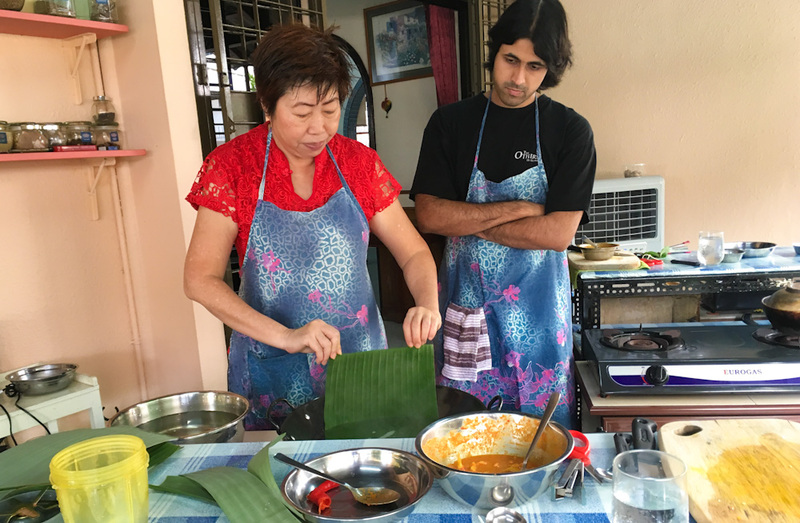 To learn more about Nyonya food while in Penang, we spent a morning with Pearly Kee, who runs cooking classes open to experts and amateurs, in her own home. Classes with Pearly start at the local market, after she comes and picks you up. 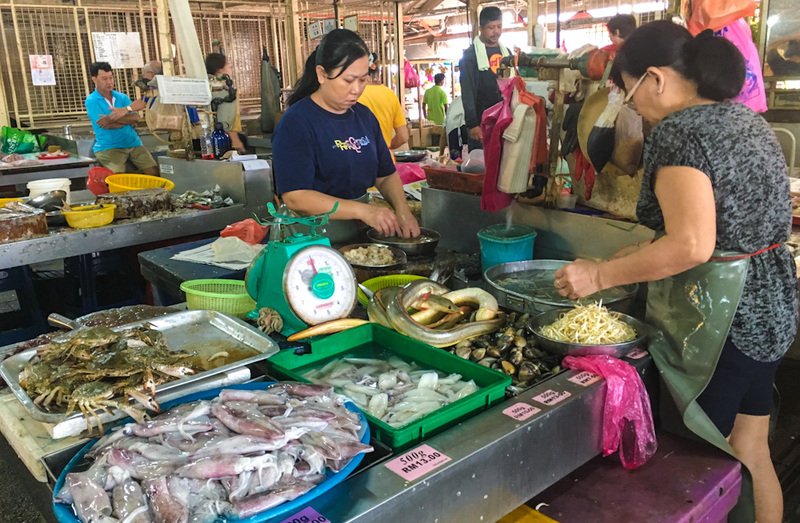 At Pulau Tikus market, you’ll stroll by the happening alleys with seafood, meats, vegetables, fruits and a lot of spices on display. 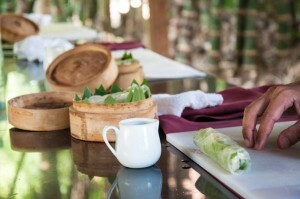 Here, you are supposed to start getting acquainted with the local food habits and main ingredients used. Apart from discussing food trivia, learning specifics like how many different types of ginger root they’ve got available or discussing the dark wonders of the much beloved century egg, the market walk is a fun opportunity to interact with local folks, sellers and patrons alike. While the eyes can also feast on the colorful ingredients on display, the market visit with Pearly does include some snacking opportunities too! 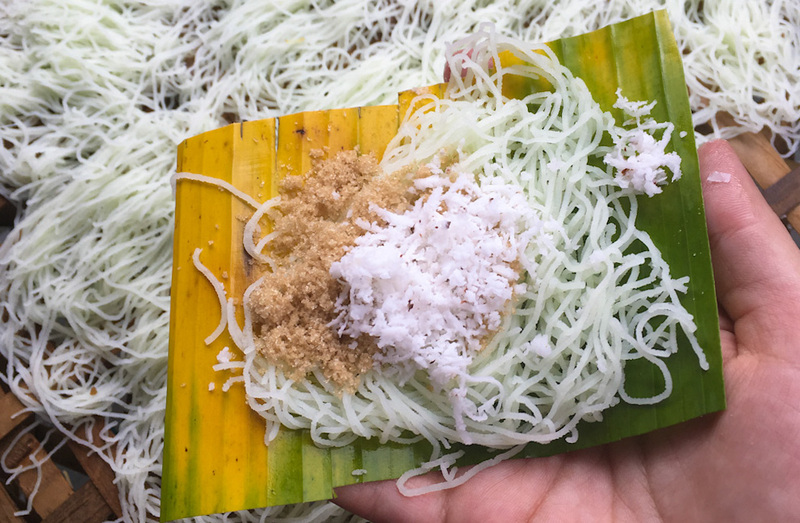 We were able to sample several fresh fruits, as well as local street snacks like Putu Mayam (shredded rice noodles with grated coconut and palm sugar) and Ban Chien Kueh (peanut pancakes). Even these fairly simple market bites reflect the incredible fusion of flavors that Penang is home to! Back at Pearly’s home, we were set to start preparing a 3-course meal. On the menu, we had Otak Otak, Assam Hae and Ayam Masak Merah, which we had chosen from a longer list of dishes suggested when you sign up for class. The suggested dishes do include vegetarian options for those who do not eat meat or seafood. Otak Otak sounds like fun to pronounce, is fairly complex to make and very spicy to eat! 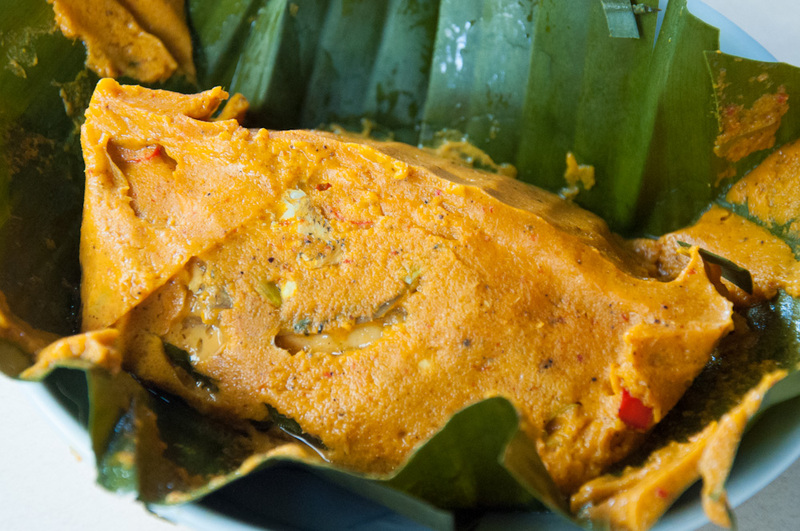 This smooth custard with fish is steamed inside a banana leaf. It makes for an eye pleasing starter, and an extremely aromatic experience. Assam Hae, perhaps my favorite dish to come out of our cooking session, was also the simpler one to make. This recipe consists of chunky prawns stir-fried with heaps of tamarind sauce. 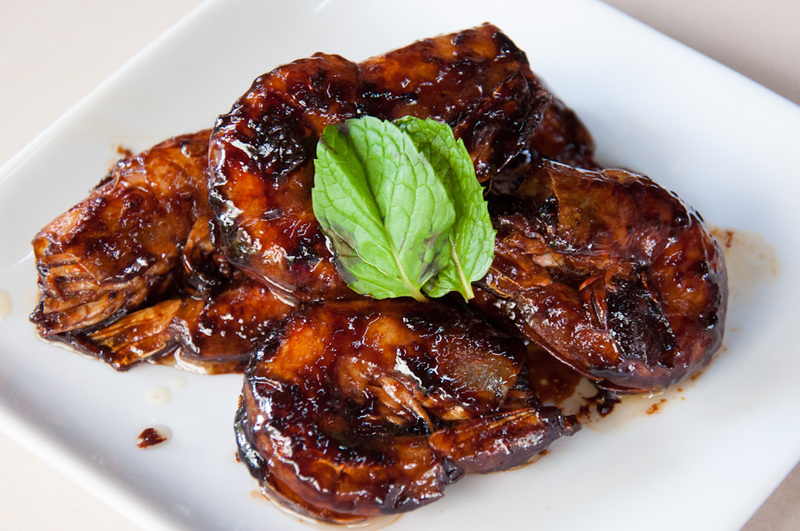 The tamarind juice cooks in the wok with the prawns, until the liquid is reduced and obtains an almost caramel-like consistency. By the time the prawns are in your plate, you almost don’t care much about the flesh, and concentrate your energies into sucking every single drop of syrupy tamarind left around the peels of the creatures. Our main dish of the day, Ayam Masak Merah was more Malay than Nyona, and also a good example of the union between local Malaysian, Indonesian and Indian cuisines, celebrated around here. 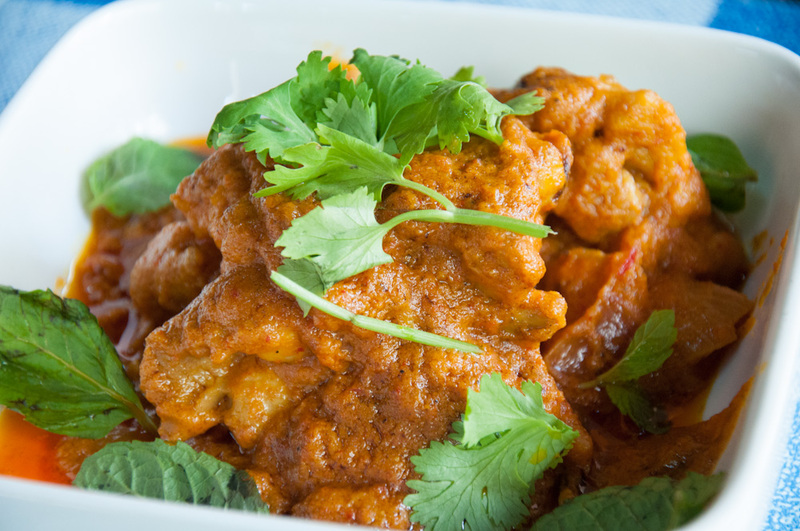 This spicy chicken curry is reminiscent of the Indian favorite Butter Chicken, with added spices and subtracted cream. Cooked in a clay pot and served alongside steamed rice, this is a definite comfort eat for those who like their food with a kick! 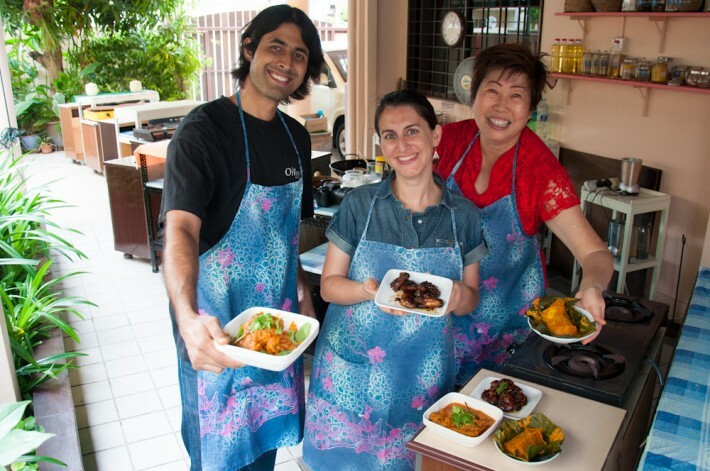 The cooking class at Penang Homecooking School is very hands-on. You make everything from scratch yourself, under the close supervision of the ever smiley Pearly Kee. She will show you how to go about it, but ultimately, what you will eat by the end of the session are the dishes you cooked all by yourself. And, let’s face it, the sense of accomplishment does enhance the final taste! In a few hours, you would have chopped vegetables, gutted fresh prawns, marinated pieces of chicken, and trimmed your own banana leaf. And although this sounds like a lot for a beginner, the class is accessible to all levels, as Pearly will always give you a hand where need be. At the end of the class, everyone enjoys the meal together, over a glass of refreshing nutmeg juice and casual chit chat with cooking class colleagues, Pearly, and her husband Chandra. 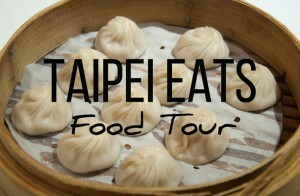 Another opportunity to learn more about food and life in Penang! 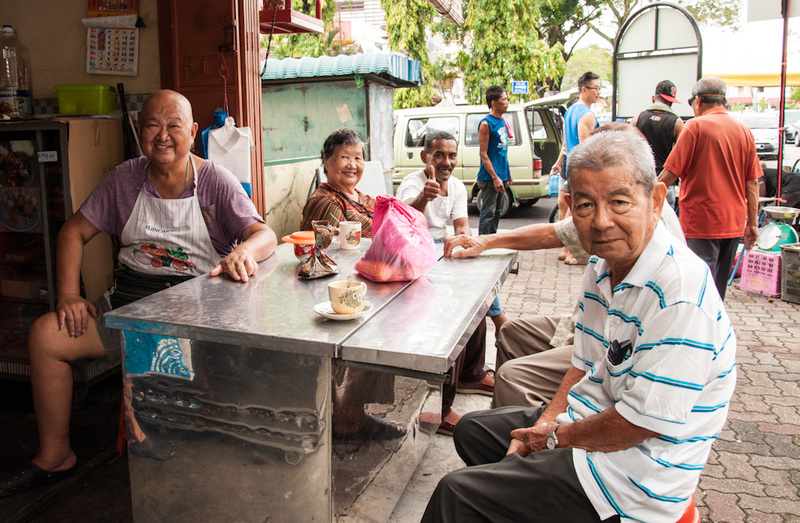 Many travel to Penang to explore the insanely rich food culture of the island. While the omnipresent food courts, street vendors and restaurants of Penang will make it easy to sample the different cuisines in town, you will only experience the real deal closer to the raw ingredients. 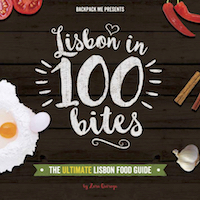 It’s going to the market and right after hopping into the kitchen, where you’ll learn the true essence of local food. This is why learning how to cook Nyonya food with Pearly was one of the most engaging things we did on our trip to Penang.